The real and painful struggles of the black players who followed Jackie Robinson into major and minor league baseball from 1947 through 1968 are chronicled in this compelling volume. Players share their personal and often heart-wrenching stories of intense racism, both on and off the field, mixed with a sometimes begrudged appreciation for their tremendous talents. 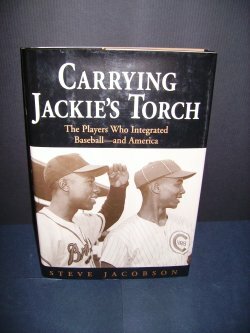 Stories include incidents of white players who gave up promising careers in baseball because they wouldn't play with a black teammate, the Georgia law that forbade a black player from dressing in the same clubhouse as the white players, the quotas for the number of blacks on a team, and how salary negotiations without agents or free agency were akin to a plantation system for both black and white players. The 20 players profiled include Ernie Banks, Alvin Jackson, Charlie Murray, Chuck Harmon, Frank Robinson, Bob Gibson, Hank Aaron, Curt Flood, Lou Brock, and Bob Watson. The Humanities Bookstore is a specialist internet department of Fireside Bookshop , based at 1 The Arcade, High Street, Littlehampton, West Sussex, BN17 5AB, U.K.
For more information and any enquiries, you can email us at info@thehumanitiesbookstore.com or phone +44 (0)1903 721985.